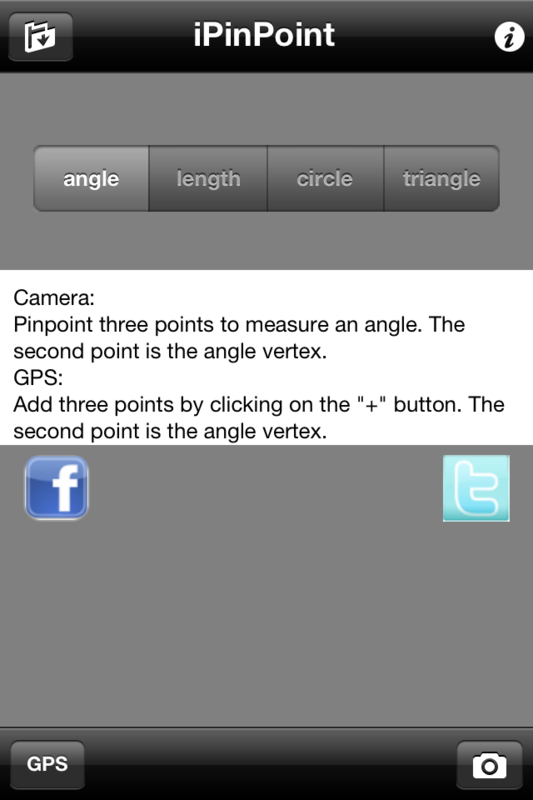 Starting with this version, when you upgrade to Pro you can save your data and create a project (only if you use the camera, it does not work for the GPS device) . Currently the following data are saved: The picture, the points that you have already pinpointed, and a note (there is no restriction on the number of words). This is the new layout, did you notice the button in the top right corner? When you click on that button, you access the project list. Click again on that button to close the list. 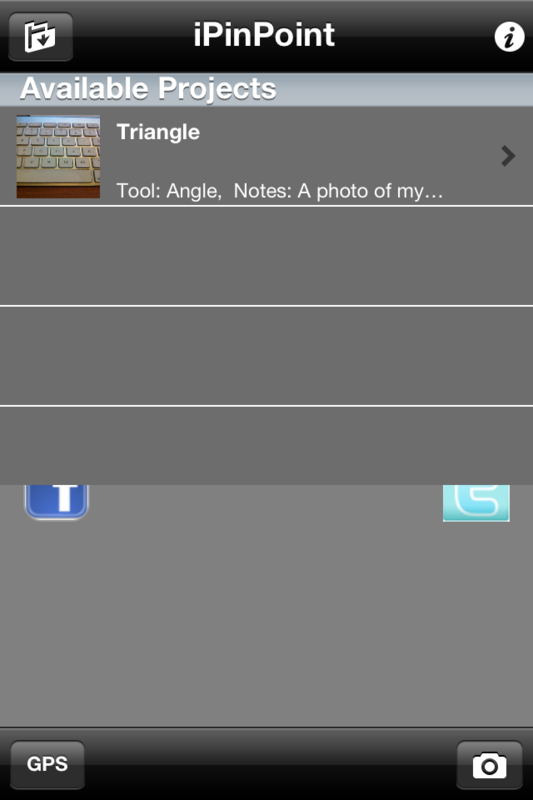 The project list has a thumbnail of the saved picture, it gives the project name, the tool that you used (i.e., angle, length, circle or triangle), and the first few words of your note. Did you notice the two buttons for the Facebook and Twitter. We are looking forward to meet you at these two social networks. There is a small rearrangement of the buttons. In the left corner where the button to "Redo" your calculations used to be, you find the button to save the current project. This button will always be present even when you have not upgraded to Pro (it won't allow you, however to create a project). If you would like to"Redo" your calculations, simply click on the "Calculation" button, and then click on "Redo Calculation" button. When you click on the "Save" you see the menu that is depicted in the Figure. 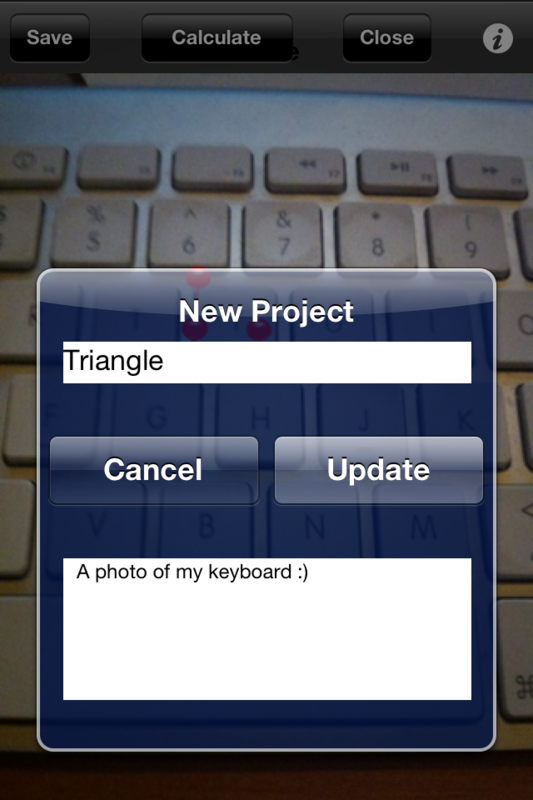 Here, you give the name of the project, and you write your note.